S p e c i a l t y T i r e s M T D J u n e 2 0 1 8 42 "is location is ideal for my specialized business," says Davis. "We are close to Chicago, just over 40 miles, but far enough west to accommodate boaters, camping buffs and be immersed in horse country. Horse enthusiasts from several nearby farms swear by the service and quality of work we provide." e Lily Lake area is also very popular for landscape and other professionals towing trailers on a daily basis during their busy seasons. 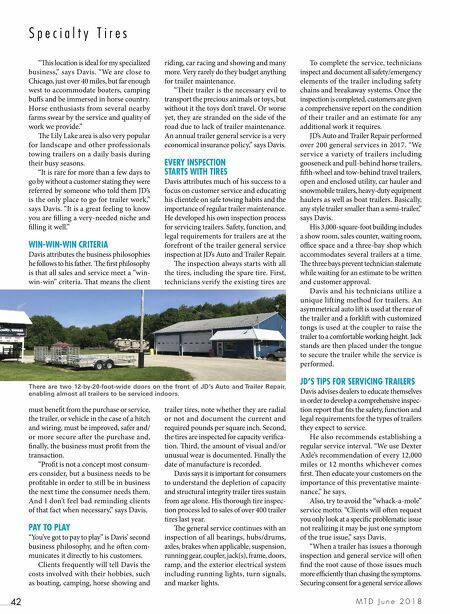 "It is rare for more than a few days to go by without a customer stating they were referred by someone who told them JD's is the only place to go for trailer work," says Davis. "It is a great feeling to know you are filling a very-needed niche and filling it well." WIN-WIN-WIN CRITERIA Davis attributes the business philosophies he follows to his father. e first philosophy is that all sales and service meet a "win- win-win" criteria. at means the client must benefit from the purchase or service, the trailer, or vehicle in the case of a hitch and wiring, must be improved, safer and/ or more secure aer the purchase and, finally, the business must profit from the transaction. "Profit is not a concept most consum- ers consider, but a business needs to be profitable in order to still be in business the next time the consumer needs them. And I don't feel bad reminding clients of that fact when necessary," says Davis. PAY TO PLAY "You've got to pay to play" is Davis' second business philosophy, and he oen com- municates it directly to his customers. Clients frequently will tell Davis the costs involved with their hobbies, such as boating, camping, horse showing and riding, car racing and showing and many more. Very rarely do they budget anything for trailer maintenance. "eir trailer is the necessary evil to transport the precious animals or toys, but without it the toys don't travel. Or worse yet, they are stranded on the side of the road due to lack of trailer maintenance. An annual trailer general service is a very economical insurance policy," says Davis. EVERY INSPECTION STARTS WITH TIRES Davis attributes much of his success to a focus on customer service and educating his clientele on safe towing habits and the importance of regular trailer maintenance. He developed his own inspection process for servicing trailers. Safety, function, and legal requirements for trailers are at the forefront of the trailer general service inspection at JD's Auto and Trailer Repair. e inspection always starts with all the tires, including the spare tire. First, technicians verify the existing tires are trailer tires, note whether they are radial or not and document the current and required pounds per square inch. Second, the tires are inspected for capacity verifica - tion. ird, the amount of visual and/or unusual wear is documented. Finally the date of manufacture is recorded. Davis says it is important for consumers to understand the depletion of capacity and structural integrity trailer tires sustain from age alone. 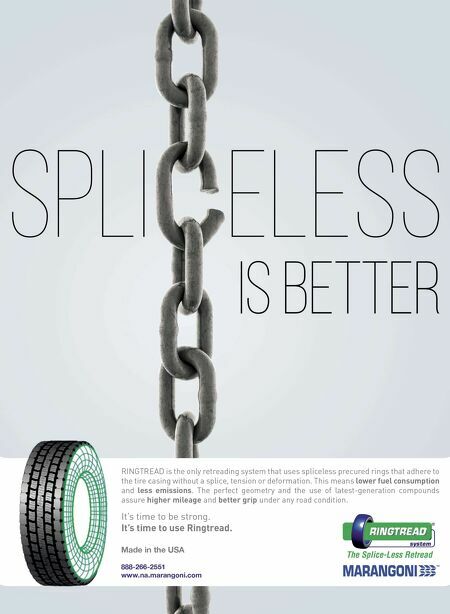 His thorough tire inspec- tion process led to sales of over 400 trailer tires last year. e general service continues with an inspection of all bearings, hubs/drums, axles, brakes when applicable, suspension, running gear, coupler, jack(s), frame, doors, ramp, and the exterior electrical system including running lights, turn signals, and marker lights. To complete the service, technicians inspect and document all safety/emergency elements of the trailer including safety chains and breakaway systems. Once the inspection is completed, customers are given a comprehensive report on the condition of their trailer and an estimate for any additional work it requires. JD's Auto and Trailer Repair performed over 200 general services in 2017. "We service a variety of trailers including gooseneck and pull-behind horse trailers, fih-wheel and tow-behind travel trailers, open and enclosed utility, car hauler and snowmobile trailers, heavy-duty equipment haulers as well as boat trailers. Basically, any style trailer smaller than a semi-trailer," says Davis. His 3,000-square-foot building includes a show room, sales counter, waiting room, office space and a three-bay shop which accommodates several trailers at a time. e three bays prevent technician stalemate while waiting for an estimate to be written and customer approval. Davis and his technicians utilize a unique lifting method for trailers. An asymmetrical auto li is used at the rear of the trailer and a forkli with customized tongs is used at the coupler to raise the trailer to a comfortable working height. Jack stands are then placed under the tongue to secure the trailer while the service is performed. JD'S TIPS FOR SERVICING TRAILERS Davis advises dealers to educate themselves in order to develop a comprehensive inspec- tion report that fits the safety, function and legal requirements for the types of trailers they expect to service. He also recommends establishing a regular service interval. "We use Dexter Axle's recommendation of every 12,000 miles or 12 months whichever comes first. en educate your customers on the importance of this preventative mainte- nance," he says. Also, try to avoid the "whack-a-mole" service motto. "Clients will oen request you only look at a specific problematic issue not realizing it may be just one symptom of the true issue," says Davis. "When a trailer has issues a thorough inspection and general service will oen find the root cause of those issues much more efficiently than chasing the symptoms. Securing consent for a general service allows There are two 12-by-20-foot-wide doors on the front of JD's Auto and Trailer Repair, enabling almost all trailers to be serviced indoors.